How can we carry a 10-gram shirt in a 10-kg bag? This is the question to which Ying Gao and glass artist Michèle Lapointe have found an answer. 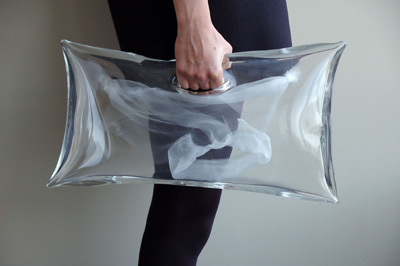 Together, they have created a glass object with a rounded contour, in which they have inserted a shirt made of super organza. This transparent piece of work reflects on the nature of accessories and their content, while being an aesthetic and formal exploration of glass and textile.